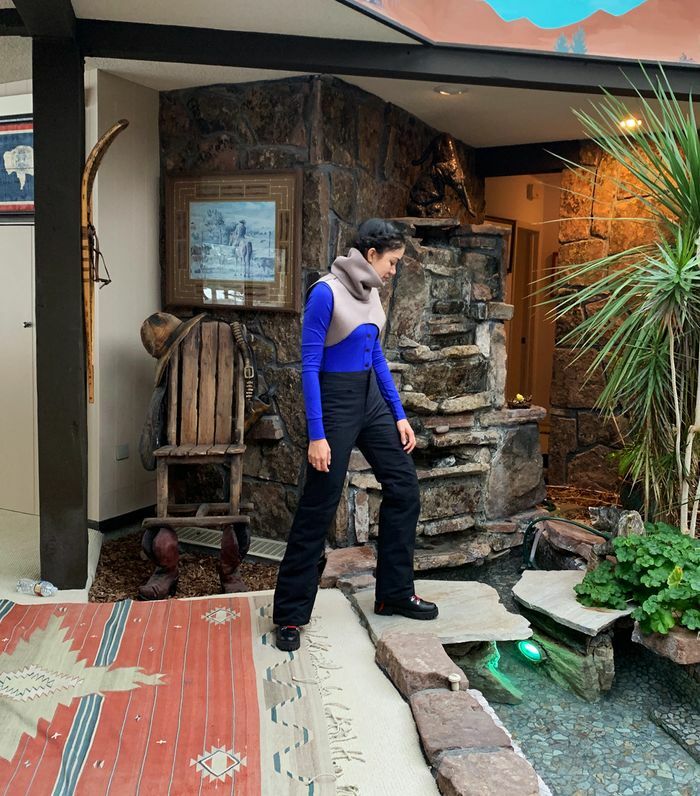 Having graduated from Parsons and worked at Nike on sportswear and performance apparel for NikeLab before founding her own line of technical performance intimates, Stern is something of an expert on layering for skiing, so I sought out her advice ahead of a family ski trip I was taking to Jackson, Wyoming. I first learned to ski in Switzerland when I was about 4 years old and living in Germany. At the time, I spoke fluent German and was fearless. These days? I can utter a danke, but that’s about it. And don’t even try to put me near a black-diamond slope. Showing off the Matek Gentoo and Dik-Dik before my first morning of skiing. What do you even wear skiing these days? I wondered. Puffer bike shorts? Obviously not. Space blanket leggings that convert the body's energy into heat? Also no, but somebody should get on that. One thing I know for sure? My other expert source, professional skier Lexi duPont, isn’t sitting around asking herself these questions. In fact, she’s designing her own gear for Eddie Bauer and literally flying herself around her hometown of Sun Valley, Idaho. Lucky for us, she took some time away from skiing in Alaska to answer a few questions I had about layering from a pro's point of view. As for me, I’m no expert, but I followed their directions and lived to tell the tale. Keep scrolling to see a designer, a professional, and a novice share the best tips for layering while skiing. For too long, the base-layer space has been basic and boring, and it hasn't fully considered the female form. Think men's items sized down and offered in typically "girly" colors like pink. Abigail created Matek to address this disparity. Her first tip? Don’t forget fit. “When things fit you better, you stay warmer,” she says. That’s why she designed her line specifically with women’s bodies in mind. Not into an actual onesie? Wear the bodysuit with the leggings, and you'll get the same coverage. You can wear these leggings all year round. As for her go-to outfit when she hits the slopes, “Eddie Bauer’s Fineline Jacket and pants are my go-tos. I personally designed this ski outfit, and I swear by it. It is great for layering and good for every ski condition.” Oh and she also shouts out Matek for the ultimate base layer. Same, girl. The most comfortable and capable ski jacket on the mountain, according to Eddie Bauer. This bib will keep snow off your body if you take a tumble or two. When it gets warm, you can wear these base layers as your only layers. Truthfully, I don't have much to add. Except maybe bring enough chapstick for everyone so you're not stuck at the top of the mountain sharing with your dad like I was. But I will tell you this: I took into account Abigail's and Lexi's tips, and I was way more comfortable than I thought I would be for my first time skiing in more than a decade. For two days in Jackson, I wore the Gentoo and the Dik-Dik with a Patagonia fleece and Obermeyer down jacket and pants (and Supergoop! Superscreen Daily Moisturizer, $38). Besides being offered in my favorite color on earth, Yves Klein Blue, the Gentoo was incredibly comfortable. (It also comes in my second favorite color: black.) I felt contained and warm and like I never wanted to take it off. The full-body long johns are made from recycled nylon and have palm tree nut buttons, an eco-friendly touch from Abigail that nods to the mountain community, which will undoubtedly be affected by global warming. The Dik-Dik is hilarious and unexpectedly stylish. It was the key part in keeping my neck and face warm as I skied down the slopes at Jackson Hole faster than I should have been doing. I can see myself wearing it on and off the slopes for many seasons to come. My Obermeyer outerwear had one job—keep me warm and dry—and that's exactly what it did. I was dismayed to find out my pants didn't have pockets, but I was able to stash my phone and accessories in the jacket, which had multiple. Keep scrolling to shop my ski outfit and some other pieces on my wish list for next year. This onesie is named after the gentoo penguin, which looks like it's wearing a suit. In fact, all Matek items are named after animals. I got this jacket in a size 8, and I'm so happy I sized up so I could add, you guessed it, layers. No pockets, but roomy and comfy. I wore a size 6 long. I wore this over my Gentoo and under my jacket. This sweater's merino wool will keep you warm while the Coolmax fibers wick moisture from the body. You can never have too much heattech. Protect your skin with sunscreen. Protect your eyes with goggles. I just want to wear one-pieces all the time. This Woolmark collab will keep you warm on and off the slopes. This sweater's slim fit makes it ideal for layering. Life's hard. Get a helmet. Already planned your next ski trip? Here's what to wear on the plane.